Fits Automatic Transmission only, 3-Bolt Flange. 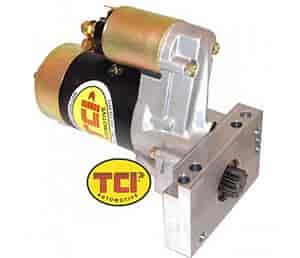 TCI offers some of the finest racing starters available for drag racing and applications where a smaller, lightweight unit is desired. Made by Hitachi for TCI, these starters are one third smaller than most original equipment starters, which means increased ground clearance and more room for headers and oil pans. JEGS 32000 - Starter Heat Insulator 7" x 24"